Moments with the Mays: Griffin is 7 months old! 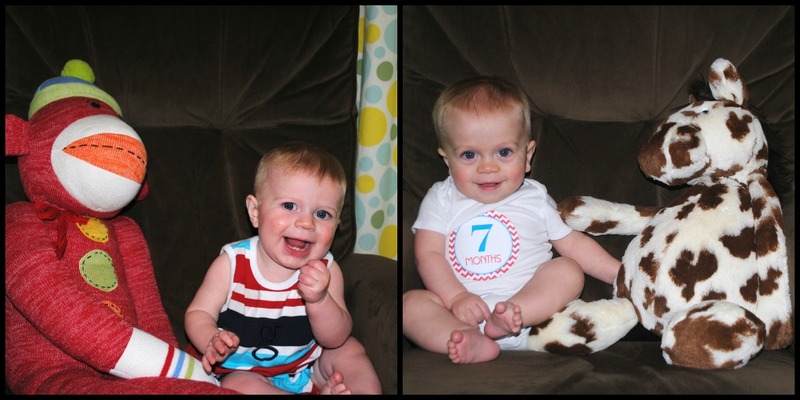 Griffin, you are 7 months old! Clothes: all 6 month and STILL some 3-6 month. You are tiny! However, your foot is getting a little snug in your pajamas so it's about time to move up! Eating: Well, Mr. Griff, this month you self-weaned. A few weeks ago we switched you to formula & you've done great! I'm so glad we were able to breastfeed for 6 1/2 months. You are now easily eating every 4 hours during the day--yay for a full belly! You are taking between 5oz-7oz with each feeding. You eat solids at least twice a day. Your favorite purees are: pears, apples, & peaches. You aren't as fond of veggies so I tend to mix them with your fruit. You eat some table food but still refuse to make any attempt at feeding yourself! You LOVE rice...especially Pei Wei's fried rice. My kind of boy:) You occasionally snack on mum mums & yogurt melts. We moved you out of the high chair this month & into a booster seat and you are SO much happier! You love sitting with us at the table & being across from your big brother! Sleeping: Formula was a BIG game changer with your sleeping habits. You are sleeping so much better now & I think it's because you are finally getting that little belly full! Over the past 2 weeks you have been sleeping through the night (HOORAY!) & getting yourself back to sleep pretty easily if you wake up. We've learned that going into your room when you cry just makes it worse. You have learned to self soothe & it's great! You go to bed around 7:00 each night & have been sleeping until 6:45. You are taking 2 naps a day right now. Usually from 9:00-10:30/11:00 & 1:00-2:30. I am so happy you are sleeping better! We went on your first long roadtrip to Florida & you did great! Sitting in a booster seat at our table instead of a high chair. You've started sleeping on your tummy a lot more! You got your first tooth this month & you are working on a couple more! You are now trying SO HARD to crawl & pull up on things. You are a strong little guy! MOVING. Good grief, child, you never stop moving! You want to crawl & roll everywhere! morning drop-offs at MDO because it messes up your nap! being contained in your jumper or exersaucer for more than a few minutes. You are trying really hard to be a big boy like your brother...I need you to slow down! Just a little comparison of our two boys at 7 months. Grayson looks so much bigger! G was about 2lbs heavier & 2 inches longer at this point. Sweet Griff, you are our little peanut! 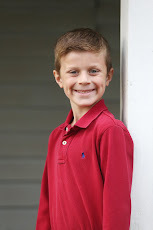 Griff, you make our days brighter with that sweet smile. You are such a happy baby! I think you tricked us by being so mellow in the beginning...you are trying to get into everything these days! You will definitely keep us on our toes once you're really moving. I am having so much fun watching you & Grayson interact more these days. He wants to play with you now & that makes you so happy. You adore your big brother & he's so proud of you. There are so many days that I still look at you & can't believe you are mine. You are so precious to me, baby boy! He is such a happy and adorable little guy! Okay, I thought I was the only one with cute kids (hey, I'm biased! :)), but this little guy is absolutely adorable!! Reading posts like this make me long for another baby so I can experience all of these little milestones over again. He is, well both of your guys, are precious! !